A Utopian Short Story now Available on Audible! Lee Ann’s latest recording of a utopian short story by Winnifred Harper Cooley is now for sale on Audible. It’s called A Dream of the Twenty-First Century. Not long after the beginning of the 20th century, a woman has a dream about what she imagines the 21st century will bring. This utopian fiction piece was written by Winnifred Harper Cooley in 1902. Cooley is best known for her book The New Womanhood. Cooley’s mother, Ida Husted Harper, was an author, a journalist, and a prominent figure in the United States’ women’s suffrage movement. To listen to a sample and/or purchase the story, please click here. 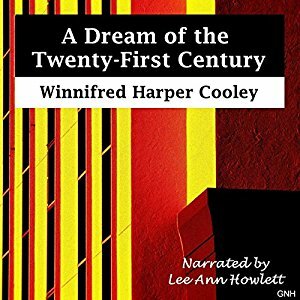 Posted by lahowlett on February 13, 2017 in Uncategorized and tagged Audible, audiobooks, Short Stories, The Dream of the Twenty-First Century, utopian fiction, Winnifred Harper Cooley.